Powers and Abilities: Initially, Darren Cross had superb administrative and technical skills; the exact fields are not very clear, but probably include some sort of high technology skills. After an unspecified time (probably a few months) wearing his experimental pacemaker, he developed a handful of superhuman capabilities. The most obvious was strength (somewhere around Enhanced Human), but his speed, senses and healing were also enhanced to superhuman levels. After harvesting the Pym Particles from Cassie Lang's heart, Darren Cross was able to manipulate the size of his body, though he was not able to properly control his size-shifting, often changing sizes at random. Weaknesses: Complete lack of ethics; a strong tendency to brag about his plans; at least a hint of berserker rage; freakish and intimidating appearance that greatly hindered his social capabilities (not that he seemed to miss them much, really). 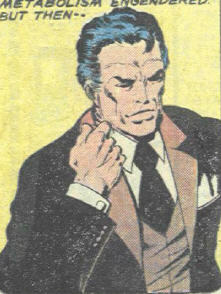 Originally, Darren Cross was forced to undergo near-constant heart transplants in order to survive his pacemaker's mutations but after he harvested the Pym Particle-saturated heart of Cassie Lang, Cross no longer suffered that affliction, as the Pym Particles allowed his heart to compensate for the pacemaker's enlargements. (Ant-Man I#4 (fb) - BTS) - Refusing to give up and die of his heart condition, Darren Cross designed an experimental nucleorganic pacemaker. (Marvel Premiere I#48 (fb)) - Once the pacemaker was under development by his research staff, Darren submitted to an implant of the experimental sophisticated nucleorganic pacemaker, which saved his life. However, it worked too well and evenually began to increase the size of his entire circulatory system, and the rest of his body by extension. 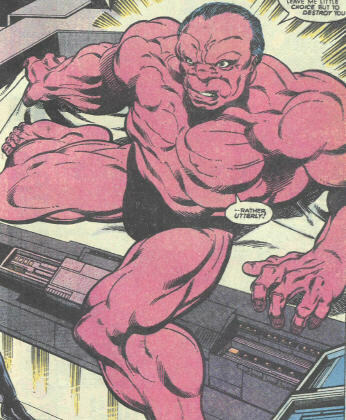 As a result he mutated into a slightly mishappen brute with superhuman attributes. Since no human heart could keep up with the implant's toll, he was forced to submit to a series of heart transplants. He eventually learned of Dr. Sondheim's heart transplant skills and decided to forcefully get her permanent help. At the same time, realizing that he would never get voluntary donors fast enough to survive, he kidnapped a number of vagants and homeless people and kept them captive as a source of living hearts. (Marvel Premiere I#47 (fb)) - While overseeing Dr. Sondheim's abduction, Darren met and tossed away Scott Lang, who wanted her help in saving his daughter's life. (Marvel Premiere I#47) - His next heart transplant was interrupted by Scott Lang, debuting his new Ant-Man identity in a desperate attempt at finding help for his daughter, Cassie. When his CTE security personnel were defeated by Ant-Man, Darren was forced to act directly. (BTS) - Dr. Sondheim misdirected Darren into believing he had indeed received a new heart during the interrupted surgery. (Marvel Premiere I#48/Ant-Man I#1 (fb)/Ant-Man I#3 (fb)/Ant-Man I#4 (fb)/Ant-Man I#5 (fb)) - Darren fought Ant-Man (Scott Lang) so that he didn't free Dr. Sondheim -- and to get yet another unwilling heart donor. Ant-Man was briefly captured, but escaped and resumed his fight with Darren, who ended up collapsing from a heart attack. (Ant-Man I#3 (fb) - BTS) - Darren Cross died from the heart attack and was placed in stasis by his son Augustine within CTE. (Ant-Man I#4 (fb) - BTS) - Kept in stasis, Darren Cross remained in exactly the same state that he was mere seconds following his death. (Ant-Man I#3) - Augustine eventually kidnapped Dr. Erica Sondheim and kept her at gunpoint as he explained how his father had died due to Dr. Sondheim "failing" Darren. He then revealed that she had the opportunity to atone for her past "mistake," unveiling the body of Darren Cross, who was in stasis, and revealing that he planned to have Dr. Sondheim bring Darren back to life. (Ant-Man I#4) - As Darren remained in stasis, Augustine reviewed Darren's origins with Dr. Sondheim and revealed that CTE had found the perfect donor to permanently solve Darren's heart condition and restore him to life: Cassie Lang, daughter of Ant-Man. He further revealed that if Dr. Sondheim refused to transplant Cassie's Pym Particle-imbued heart into Darren Cross, he would have his men first kill Cassie and Sondheim's son Abe, then Dr. Sondheim herself. Learning of Cassie's kidnapping, Ant-Man later infiltrated CTE with his allies Machinesmith and Grizzly but found himself pinned underneath the foot of the revived Darren Cross, whom Dr. Sondheim had transplanted Cassie's heart into. (Ant-Man I#5/Astonishing Ant-Man I#1 (fb)) - Unaffected by Darren Cross' stepping on him due to the retaining of his human strength, Ant-Man grew to human size and forced Darren off of him. Soon recognizing Dr. Sondheim in the corner, Ant-Man was warned to stay back and to keep Darren away from her as she transplanted a new heart into Cassie Lang to save her life. Darren's rampage was briefly halted by Augustine, who hugged his father, happy to see him alive again, in the middle of the fight. Deducing that the donor who had revived him was Cassie Lang, Darren Cross turned his attention towards Cassie in an effort to hurt Ant-Man through her. Ant-Man fought back and was soon knocked through the wall by Darren, forcing both to fall from the high story building. On the ground, Ant-Man covered Darren from head to toe in ants before Darren knocked the ants off and prepared to deliver the finishing blow to Ant-Man. Unfortunately, Darren proved unable to properly control the Pym Particles within his body and began shrinking. Ant-Man mocked Darren's tiny size, promising he would get used to it, before Augustine arrived in a flying vehicle and fired on Ant-Man, buying Darren time to board Augustine's vehicle and escape. (Astonishing Ant-Man I#1) - Some time later, Darren Cross prepared for impending work at Cross Technological Enterprises, his assistants working on restoring his proper skin tone. When his son Augustine happily arrived and hugged him, Darren attempted to adjust his size back down to Augustine's level, explaining to Augustine that his heart condition was now non-existant thanks to Cassie Lang's Pym Particle-charged heart. Darren then began uncontrollably getting smaller, prompting Augustine to assure Darren that if a "low-class criminal" like Scott Lang could master Pym Particles, it should be no problem for the genius Darren and that it would just take time to adjust to the Pym Particles in Darren's body. Augustine then reminded Darren of their meeting with the enigmatic Power Broker, who had created apps that Augustine thought CTE should invest in. After arguing the usefulness of app technology, Darren Cross agreed to meet with the Power Broker, who presented Cross with his new Hench app. Continuing his presentation, the Power Broker decided to demonstrate the Hench app by using it to search for a costumed super villain to take care of Cross' enemy, Ant-Man. The app located Whirlwind and immediately sent Whirlwind after Ant-Man. Cross then watched on the Power Broker's phone (thanks to a gopro camera installed on Whirlwind's costume) as Whirlwind battled Ant-Man. Thinking that he was going to watch Ant-Man's death, Cross was quickly reminded by the Power Broker that the footage was merely a trial run until Cross had decided to invest. Darren was ready to pay any amount into the thousands but the Power Broker asked for 1.2 billion, prompting Darren to angrily accuse the Power Broker of criminal extortion and decline to pay for it. The Power Broker then canceled the assassination and gave Whirlwind new orders, causing Darren to grow in size proportionate to his anger at the canceled assassination attempt. The Power Broker then departed, leaving Darren Cross' head stuck in the ceiling as Augustine ordered the Power Broker to return. Comments: Created by David Micheline, John Byrne and Bob Layton. Darren Agonistes Cross was unwillingly responsible for the existence of the new Ant-Man, because it was his intervention that made Scott Lang resort to extreme measures in order to assure his daughter's heart operation. Under "Powers" the enhanced healing is a logical extrapolation of mine -- Darren battled Ant-Man literally while getting up from a heart transplant. Since he wanted so much to survive, I can only guess he had already spent enough time to recover from the surgery, which implies enhanced healing if not all-out Wolverine-style instant regeneration. The story also showed his enhanced vision and strength, and (IMO) speed. It is logical to assume that other capabilities were similarly improved, including his other senses -- and for that matter, his metabolism -- I am willing to bet he ate a lot. Kim the Beetle tells us that Darren's son, Augustine, took over the business after his death. Profile by Luis Dantas; updated by Proto-Man. CTE - Cross Technological Enterprises, the company that Darren founded and that, at one time or another, employed or was investigated by Hawkeye, Ant-Man (Scott Lang), El Aquila and Mockingbird.